CooperVision has recently upgraded its Biomedics 1 day 30 pack to Biomedics 1 Day Extra 30 pack. The original Biomedics 1 day have been upgraded to be more wet-table and comfortable for the wearer, and it have been introduced under the new name Biomedics 1 Day Extra 30 pack. The Biomedics 1 Day Extra 30 pack contact lenses are ideal for daily use, convenient to insert and remove, and safe for allergy sufferers. Made of the material Ocufilcon and enriched with 52% water content, the Biomedics 1 Day Extra contact lenses offer stable and comfortable vision. The unique features of the Biomedics 1 Day Extra 30 pack lenses are a horizontal ISO thickness and a wide ballast band (for stability). 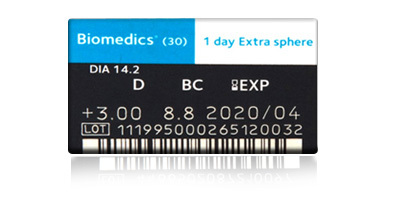 If you are a regular lens wearer, then Biomedics 1 day extra 30 pack is a wonderful upgrade. 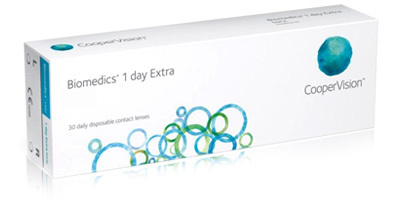 If you are new to contact lenses, then Biomedics 1 Day Extra contact lenses are a brilliant starting point. You can wear them and forget about them for up to 16 hours (subject to your Opticians advice). 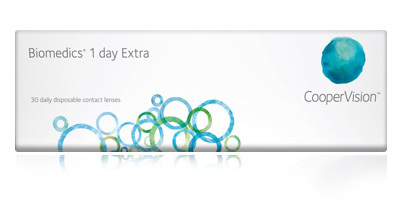 Get the most natural and comfortable vision with our Biomedics 1 day extra 30 pack. We source our contact lenses directly from the manufacturers and offer them at unbeatable prices. Base Curves: 8.6mm for minus powers and 8.8mm for plus powers only.